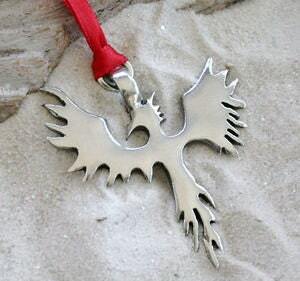 This exquisite Phoenix Ornament is handcast and hand-finished in solid American Pewter with a shiny finish resembling antiqued sterling silver. This unique Holiday Ornament comes with a Red Satin Ribbon ready to hang from your Christmas Tree or as a Holiday Decoration for your home. They also make terrific gifts...you and your loved ones can enjoy this lovely keepsake for years to come! Length with loop: 2 1/2"
A universal symbol of the worship of the sun, mystical rebirth, resurrection and immortality, this legendary red "Fire Bird" was believed to die in its self-made flames…only to rise out of its own ashes…hence the Rising Phoenix.